Power Steering – Industrial Chassis Inc.
That’s right! Available again, the really correct IFS kit for your Classic Truck is available. The only true truck suspension kit for you classic, rack and pinion, double A-frame rugged and designed to last. The correct track width, you can use readily available and inexpensive wheels and tires, two choices of bolt patterns, including a stock 5 on 5 1/2″ to match your stock or upgraded truck rear axle. This kit can take your abuse. Designed for heavy loads or just a nice daily driver, this kit works with most engines including heavy diesel up to 1000+ pounds. With the addition of an anti-roll bar and a performance oriented shock absorber, it will carve corners with confidence. Add a pair of dropped spindles and get the stance you want, this kit will meet the demands of most all you need. Larry V dropped off this 1956 Thunderbird a while back for us to do a power steering upgrade and install a tilt steering column. Very cool little ride he has here, so nice that Rick Amado spotted it in the back room during our open house and had to shoot it for one of the magazines. Lowered with Jamco springs and shocks front and back. Stock running gear and brakes but someone removed the stock hydraulic assisted power steering ram and installed a smaller diameter steering wheel. The smaller wheel made ingress and egress slightly better, but made steering this machine a bit more difficult than it needed to be. I drew up a couple of ways to put power steering back on this and Larry made the decision to go with Gearhead Cruiser Products and their 605 Power steering conversion and a Flaming River tilt steering column. The PO’s were placed in mid November, hopefully ahead of the holiday rush and before our open house party. There was confusion on the order with Gearhead, somehow I forgot to add the steering gear to the order but Theresa caught the mistake early enough and corrected the issue. I also spoke with Flaming River on the steering column to make sure we got the correct column. 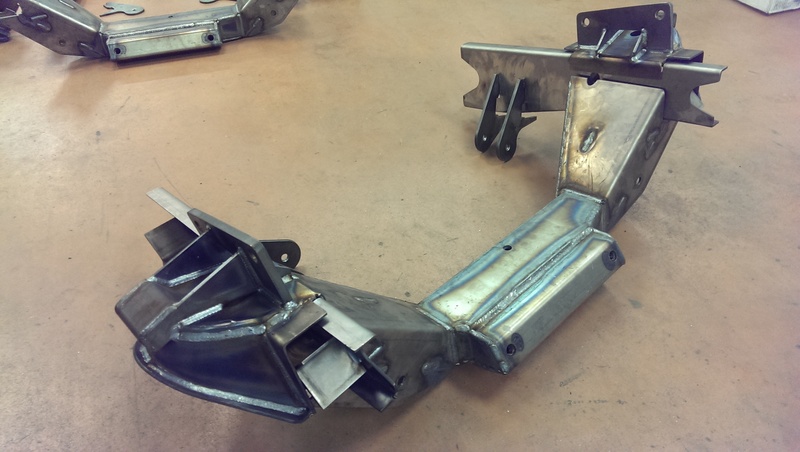 When the column arrived just after Christmas, it was for a stock steering gear application. Very nice part but would not work for the situation and not what I had ordered, got an RTA and returned the column for the correct one. I received the power steering pump and hose kit from Gearhead shortly after receiving the wrong steering column. Decent enough bracket and nice quality hose and fittings. The correct steering column showed up the just before the new year and the steering gear showed up on January 4th. All the parts here it took Joel just three days to disassemble the original steering system and install the new stuff. Everything went very straightforward and the instructions from Gearhead were very decent. Joel had to create a notch in the fan blades to clear the snout on the power steering pump and the odd way Gearhead attaches the bracket to the engine required a bit of shimming to get the belt to line up. Outside of that there were no other issues of installation. The results are very noticeable, steering effort is very modern and ingress is much more comfortable with the tilt column. We did have a small leak on the steering box after we got the system bled. A simple tightening of the adjuster stopnut on the sector shaft cured the issue. The little ‘Bird is good to go! Thank you to Theresa @ Gearhead Cruiser Products for the very professional service. Our customer is sure to be satisfied with the quality of the new power steering.